This week saw the big finale of the 8 episode original HIV comedic web series, Merce. I was so intrigued when I first heard about Merce last year, via an Indiegogo campaign - could a comedic story centered around a guy living in NYC work? I believed. I donated. I blogged about it. We’re thrilled with the response to Merce! For the most part, we’ve gotten nothing but positive feedback. Even people that were apprehensive at the idea of an HIV+ musical comedy, once they watched an episode or two, were hooked, and find the show charming and hilarious and wonderful. 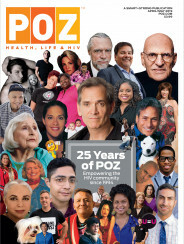 I would love if every episode had a famous HIV+ person in it, like you, Mark S. King, Peter Staley, Greg Louganis, Mondo Guerro, Jack Mackenroth, dreamy Andrew Sullivan and the like. And I’m not sure what I’d have those people do, but I’d hope that they’d be willing to have a ball and dance sparkly dances with us! OY. We’re still reeling from season 1! But my producing partner Tyne Firmin and I have talked about what season 2 might look like, and it’s a definite possibility, perhaps next year. Merce’s message of living life with joy and humor and love is and important one, and the more we can get his silliness out into the world, the better. Soon after my HIV diagnosis almost 12 years ago, I was told that stress and worry are some of the worst things for the health of us pozzers, as you call us (I adore that, by the way). The opposite of stress and worry is joy and lightness, and that’s what I try to convey with Merce. It’s also how I try to live my life, by choosing joy.